WHAT ARE/ WHO IS- BIG RIVER Darts? BRD is a Division of Big River Things, Inc.; Located in Clinton (Eastern) Iowa- Just one block from the Mighty Mississippi River! We have been selling Quality Darts and Darting Supplies to the Wholesale & Retail Trade since 1985. Our Retail Store opened on June 15, 1991 and is visited by dart players from all over the Midwest! 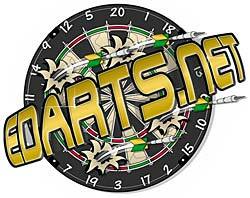 We are an Authorized Distributor for Dart World, Laserdarts, Metroline, Bottelsen, DartMaster, and GLD. We take Great Pride in keeping up with all of the latest developments in the World of Darts Supplies! Customer Service IS our Top Priority. We've grown to learn that we can't make everybody happy all of the time... but We Sure Try! Honest Communications, we feel, are very important in the running of a Darts Pro Shop. We discount all of our products on a Balanced Scale. We will not drag you into a shopping cart with Low-Ball pricing and "suggest" you stock-up on expensive extras. We Wholesale to Taverns, Vendors, and other Legitimate Darts Resellers. Mail-Order Customers can save Big Bucks when ordering for a Group or a Team! BRD specializes in Darts! Thanks for visiting our webstore! Because of the recent Drastic Decrease in the value of the US Dollar vs the British Pound... Our costs of goods from the UK (where most of Quality Darts & Parts are made) have risen over 20%. New prices for many items will become a reality on March 1, 2019. We will try to keep most accessories (smaller items) prices steady for as long as possible. Sorry for the Crappy News.